Perm (Roushie: Пермь; Komi-Permyak: Перем, Perem; Komi: Перым, Perym) is a ceety an the admeenistrative center o Perm Krai, Roushid, locatit on the banks o the Kama River in the European pairt o Roushie near the Ural Muntains. Frae 1940 tae 1957 it wis named Molotov (Мо́лотов). Accordin tae the 2010 Census, Perm's population is 991,162, doun frae 1,001,653 recordit in the 2002 Census an 1,090,944 recordit in 1989 Census. As o the 2010 Census, the ceety wis the thirteent maist populous in Roushie. 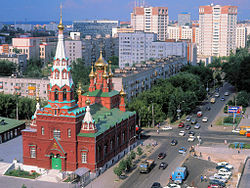 Perm haes a humid continental climate (Köppen climate classification Dfb). ↑ "Climatological Information for Perm, Russia". Hong Kong Observatory. Retrieved December 15, 2012.